Regent’s Canal was fully opened in 1820 and linked the Grand Junction Canal, which ended at Little Venice in Paddington in London’s west, with the East London Docks and Limehouse in the east. Architect John Nash was one of the directors of the canal company and it was thanks to his friendship with the Prince Regent, the future King George IV, that the canal obtained its name. Nash saw the canal as an integral part of his plans for The Regent’s Park and it now runs along the park’s northern edge. Nash’s assistant James Morgan was the canal’s chief engineer. 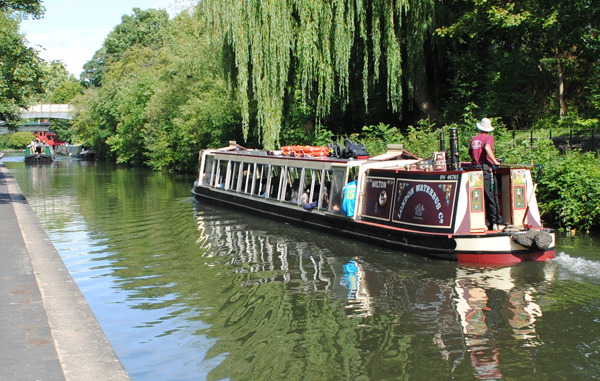 The waterbus service, which operates between Little Venice and Camden Loch, runs at various times daily until October. See here for timetable details.